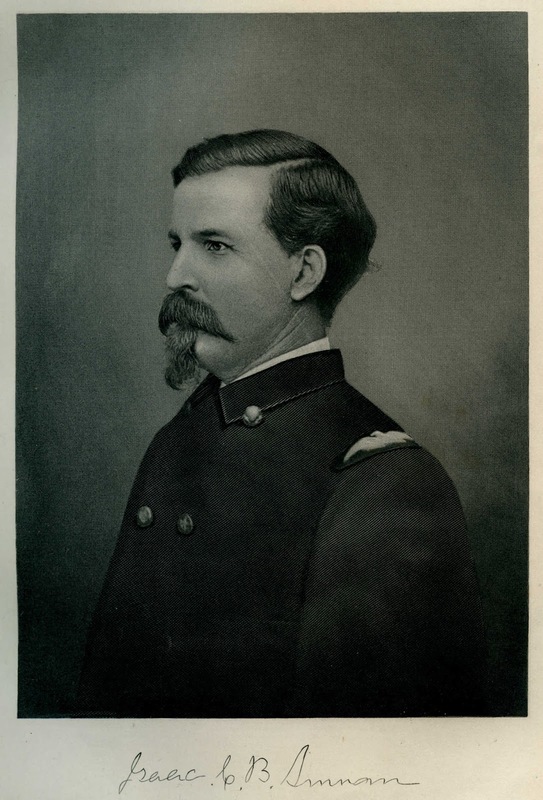 When the contributions of Porter County, Indiana, to the American Civil War effort are discussed in publications, invariably Colonel Issac C. B. Suman is mentioned as a local hero. Suman was born on January 4, 1831, at Middletown, Frederick County, Maryland, the seventh and youngest child of Albert Ellsworth Suman and Mary Elizabeth (Lantz) Suman. Yet, Suman's family history is a bit of an enigma. What is rarely mentioned in biographical sketches of Colonel Suman is that his father Albert, a veteran of the Revolutionary War serving under General Francis Marion, "had been a large slave-owner." And no biographical sketches mention that his paternal grandfather was convicted of high treason against America. Engraving of Isaac C. B. Suman. History of Porter County, Indiana, 1912.
out to satisfy court judgment against the Suman brothers. 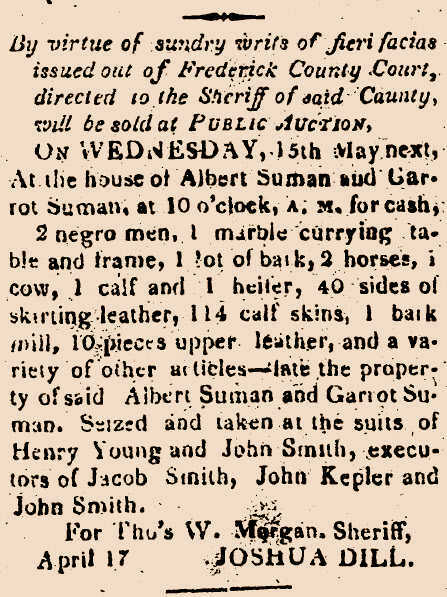 Source: Republic Gazette and General Advertiser, April 20, 1822. Isaac C. B. Suman was raised in Maryland and educated in the common schools there. His father had suffered several business failures and died in 1842, leaving the Suman family in strained financial circumstances. Likely seeking adventure and a more stable life, Isaac enlisted in the 1st Artillery of the United States Army in May 1846, serving under Major Samuel Ringgold for approximately two years during the Mexican War. Service records at the time of Isaac's enrollment into the Army describe him as nineteen years old, five feet seven inches tall, grey eyes, brown hair, light complexion, and employed as a farmer in Frederick, Maryland. After serving under Major Ringgold, Suman was transferred to the 2nd Dragoons of the United States Army (a cavalry unit), where he was under the command of General Zachary Taylor. 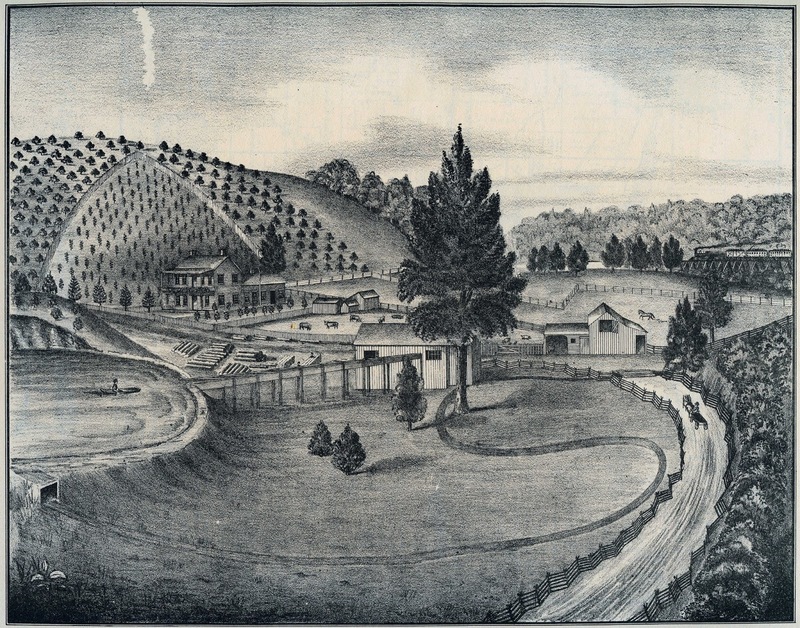 During his three years with the Dragoons, Suman participated in military engagements at Bueno Vista, Monterey, Palo Alto, and was present during the Army's capture of Mexico City. When the Mexican War concluded, Suman returned to Maryland. 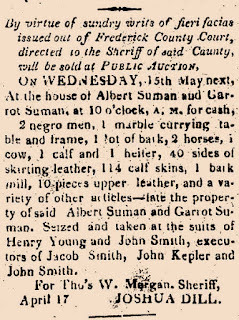 It has been written that Isaac C. B. Suman was a "strongly opposed to slavery," and that in the fall of 1852 he "started on foot for the Northwest" with $8 in his pocket. For a short time, he was engaged in the carpentry trade at Wooster, Wayne County, Ohio, but then moved to Valparaiso, Indiana, where he continued his trade in carpentry until the outbreak of the Civil War. Suman was reportedly the second individual in Porter County to enlist for service. He enlisted for three months service as a private in Company H of the 9th Indiana Volunteer Infantry and was soon elected to serve as the company's first lieutenant. It was assumed that the war would not last long, which explains the three month enlistment period for his regiment. Suman married Catherine Margaret Goss, commonly referred to as Kate, on April 21, 1861, the day prior to departing for the front. The regiment was mustered out of service after three months and then reorganized for three years service. Suman reenlisted and was selected as Captain of Company H on August 29, 1861. 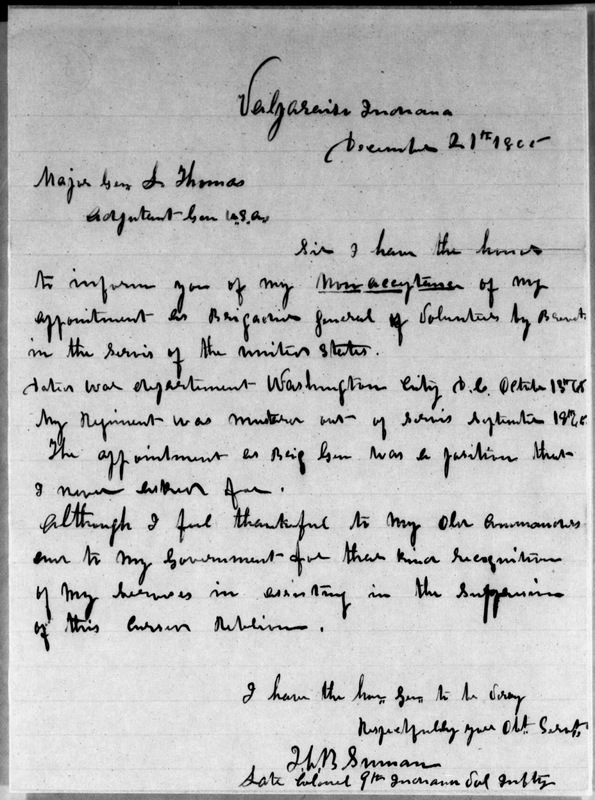 At the conclusion of the Civil War, Suman received a letter from the War Department stating that "You are hereby informed that the President of the United States has appointed you, for gallant and meritorious services during the war, a Brigadier General of volunteers by brevet." 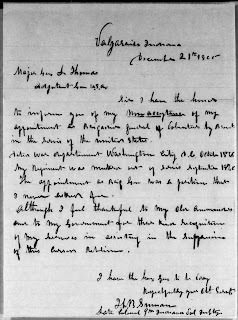 This appointment was made at the suggestion of Major General William Babcock Hazen in a letter dated June 17, 1865, to United States Secretary of War, Edwin Stanton. Sir I have the honor to inform you of my nonacceptance of my appointment as Brigadier General of Volunteers by Brevet in the service of the United States. [illegible word] War Department Washington City D. C. October 13th 65. My Regiment was mustered out of service September 18th 65. The appointment as Brig Gen was a position that I never [illegible word] for. Although I feel thankful to my old comrades and to my Government for their kind recognition of my services in the suppression of this current Rebelion. Brigadier General of Volunteers by Brevet, United States Army, December 21, 1865. No. M1064, Record Group No. 94, Roll No. 0222. Suman also declined an appointed to be the Second Lieutenant of the United States Army's 38th Infantry about fourteen months later. Second Lieutenant of the 38th Infantry, United States Army, February 11, 1867. No. M1064, Record Group No. 94, Roll No. 0369. 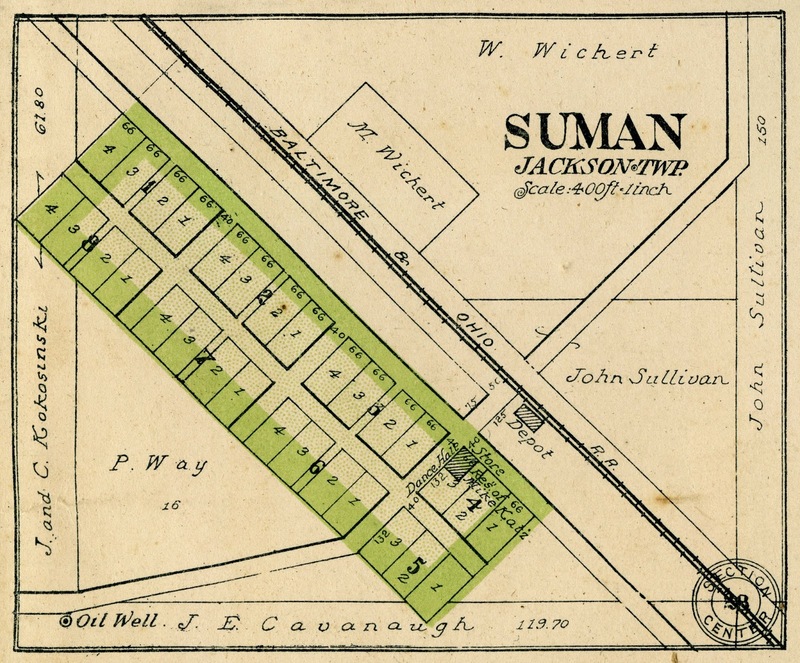 Suman returned to his wife at Valparaiso and soon purchased a farm located in Jackson Township adjacent to the Baltimore & Ohio Railroad. Isaac and Kate were the parents of four children: Ada May (Suman) Lawry Ellsmore Mehring [1862-1942], Alice Belle (Suman) Swartout [1866-1896], Bessie Estelle (Suman) Bradley [1868-1956], and Frank Taylor Suman [1873-1906]. Tragedy struck the Suman family on Tuesday, January 15, 1867, when Kate Suman's sister, Rachel Long, was murdered by Chauncey Page in Porter County's Union Township. In June of 1875, Suman recorded a plat that included thirty lots for a village he named Suman (SE¼ of NW¼ of Section 28). A post office was opened in Suman on December 21, 1876, under the name Sumanville with Isaac C. B. Suman appointed as the first postmaster. Suman would serve as postmaster until 1881; later postmasters of Suman included Robert Smith Greer, Edward Powell, and James Linderman. 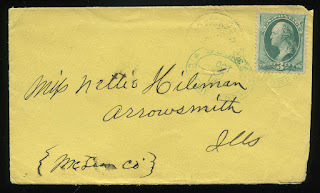 The post office's name was changed to Thelma on November 17, 1891, and remained under this name until discontinued on May 31, 1902. The village of Suman, however, was never renamed to match the new post office name. The origin of the name Thelma for the post office is unknown, as well as why the name change took place. Porter County, Indiana, October 18, 1879. 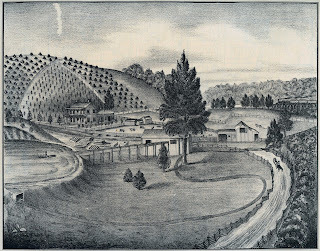 The small village of Suman prospered for a short period of time; a modest wood frame depot, small hotel, general store, and dance hall existed in the village. 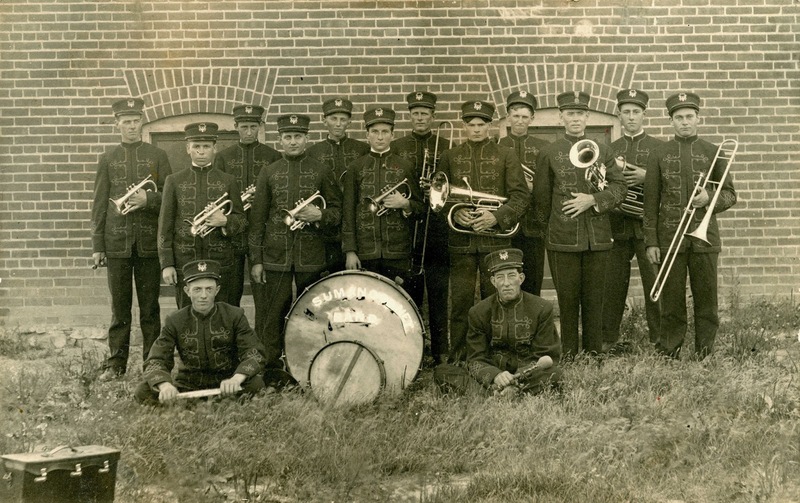 In addition, Isaac C. B. Suman organized the Suman Cornet Band, which was comprised of Jackson Township residents. The band provided entertainment to the surrounding community and participated in various county celebrations for several decades. mill in Jackson Township, Porter County, Indiana. Source: A. G. Hardesty's Illustrated Historical Atlas of Porter County, Indiana, 1876. 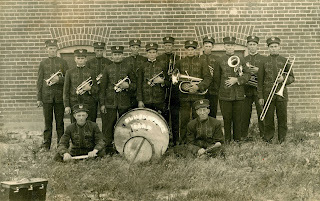 Postcard image of the Suman Cornet Band, circa 1910. In April of 1881, Suman and his family moved to Valparaiso, and on March 31, 1882, Suman was appointed the postmaster of that community. 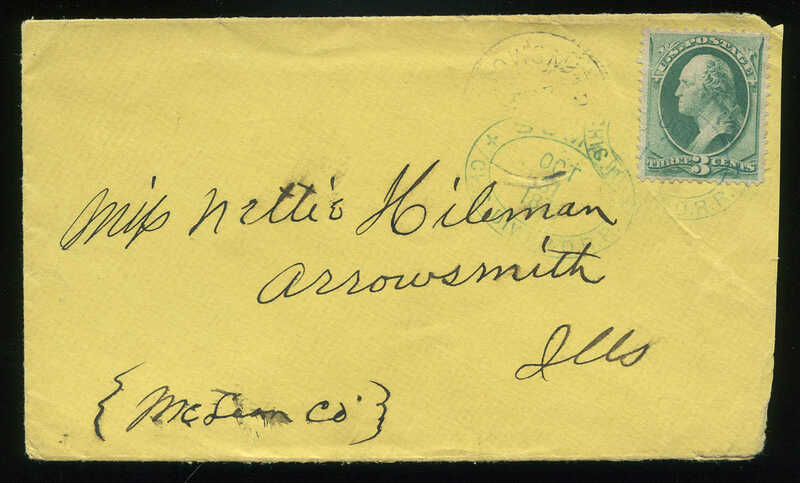 Suman would remain Valparaiso's postmaster until April 6, 1886, when he was replaced by Englebert Zimmerman. In 1894, Suman was elected to the mayoral office of Valparaiso, serving until he was replaced by Addis E. Woodhull in 1898. Plat of Suman, Jackson Township, Porter County, Indiana. Atlas of Porter County, Indiana, 1921. 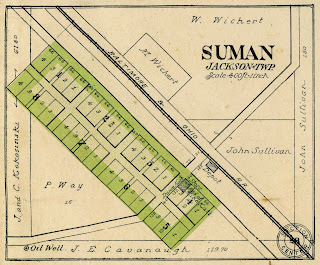 Isaac C. B. Suman also owned property in Valparaiso that he platted, referred to as Suman's Subdivision. This subdivision is bounded by Monroe Street to the north, Union Street to the south, Garfield Avenue to the west, and University Park Avenue to the east; the Valparaiso University athletic facilities are located adjacent and to the east of this residential area. Suman passed away at Valparaiso on August 7, 1911, and was interred in Maplewood Cemetery. No published biographical sketches concerning Isaac C. B. Suman mention his paternal grandfather, Peter Balthasar Suman. Yet, the story of Peter's life is absolutely shocking and must have had some influence on Isaac's life. Peter Shuman was born on May 10, 1730, in Schriesheim, Baden-Wuerttemberg, Germany. At the age of 19, Peter sailed on the ship Dragon under the command of George Spence, landing at Philadelphia in September 1749. It is believed that while living in Pennsylvania that Peter changed the spelling of his surname from Shuman to Suman. 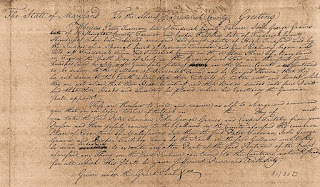 In 1754, Peter married Eleanor Beauford Miller at Tulpehocken, Berks County, Pennsylvania, and soon after the couple settled in Burkittsville, Fredrick County, Maryland, due to land disputes that they were experiencing in Pennsylvania with the Penn Company. On September 9, 1755, Peter and Eleanor had the first of their twelve children, whom they named Isaac. It is assumed that Isaac C. B. Suman was named in honor of his Uncle Isaac. Peter Suman was a member of the German Baptist Brethren faith, commonly referred to as the Dunker Church. In 1781, during the Revolutionary War, English soldiers and Hessian mercenaries were being held in the Frederick Prison in Frederick, Frederick County, Maryland. A plot was uncovered that involved British troops. Supported by their Native American allies, the British were to travel from Detroit and Canada through Pittsburgh and onto Frederick. The mission of the troop movements was to invade the town of Frederick, release the English and Hessian prisoners, and then proceed to Virginia to reinforce the British troops there. It was claimed by some in Frederick that Peter Suman was assisting in this Loyalist plot. Being a Dunker, however, it is far more likely that Peter was a pacifist and supported neither side in the war. Furthermore, his father-in-law, Michael Miller, was an ardent supporter of the war and supplied the Continental Army with blankets. Peter, along with six alleged co-conspirators, was indicted, arraigned, and tried under a military tribunal consisting of Alexander Contee Hanson, Colonel James Johnson, and Upton Sheradine. Alexander Contee Hanson was the son of John Hanson, the first president of the Continental Congress after the Articles of Confederation had been ratified. John Hanson is often claimed to be America's "first president." Colonel James Johnson was the brother of Thomas Johnson, the first governor of Maryland. Thomas Johnson was the individual that nominated George Washington to be Commander in Chief of the Continental Army; he would later become a member of the United States Supreme Court. Upton Sheradine was a significant land owner in Frederick County. The military tribunal found Peter and the six co-conspirators guilty of high treason on July 25, 1781. Their sentence: death. Peter Sueman, Nicolas Andrews, John George Graves, Yost Plecker, Adam Graves, Henry Shell, Casper Fritchie, attend. It has been suggested to the court that not withstanding your guilt has been ascertained by an impartial jury, you consider the proceedings against you as nothing more than a solemn mockery, and have adopted the vain idea, propagated by the enemies of this country, that she dare not punish her unnatural subjects for engaging in the service of Great Britain. From the strange insensibility that you have heretofore discovered, I was indeed led to conclude that you under a delusion which might prove fatal to your prospects of happiness hereafter. I think it is my duty therefore to explain to you your real situation. The crime you have been convicted of, upon the fullest and clearest testimony, is of such a nature that you cannot, ought not to look for a pardon. Had it pleased heaven to permit the full execution of your unnatural designs, the miseries to be experienced by your devoted country would have been dreadful even in the contemplation. The ends of public justice, the dictates of policy and the feelings of humanity all require that you should exhibit an awful example to your fellow subjects, and the dignity of the State with everything that can interest the heart of man, call aloud for your punishment. If the Consideration of approaching fate can inspire proper sentiments, you will pour forth your thanks to that watchful Providence which has arrested you at an early stage of guilt. And you will employ the short time you have to live in endeavoring by a sincere penitence to obtain pardon from that Almighty Being, who is to also sit in judgement upon you, upon me, upon this faithful jury, and upon all mankind. I must now perform the painful task of announcing the terrible punishment ordained for high treason. You Peter Sueman, Nicholas Andrews, Yost Plecker, Adam Graves, Henry Shell, John George Graves and Casper Fritchie and each of you attend to your sentence. You shall be carried to the gaol of Fredericktown, and be hanged thereon; you shall be cut down to the earth alive, and your entrails shall be taken out and burnt while you are yet alive, your heads shall be cut off, your body shall be divided into four parts and your heads and quarters shall be placed where his Excellency the governor shall appoint. So Lord have mercy upon your poor souls! Despite the Warrant of Execution being issued for seven men, only the executions of Peter Suman, Casper Fritchie, and Yost Plecker were carried out. Contemporary accounts of the executions indicate that Suman was indeed hung, disemboweled, and quartered, with his remains being placed on pikes or fed to dogs. It has been reported that Fritchie and Plecker were only hung until death. Several accounts state that Eleanor Suman gathered Peter's remains and secretly buried them on the Ausherman School property so they would not be further desecrated. the execution of Peter Suman by hanging and quartering. Source: Maryland State Archives, Access No. 6636-31-30B. This is to testifie that I Henry Shell the subscriber having been Indicted, Araigned and found guilty of high Treason do most willingly and Thankfully Accept the Conditions Contained in the most Gracious Pardon granted to me by his Excellency the Governor dated the eighteenth Inst and will forthwith Enter my Self on Board of one of his most Christian Majesties Ships of War during the Continuance of the present War between America and great Britain and will not depart therefrom during the continuance of the said Term. Witness my hand and Seal this twentieth day of September Seventeen hundred and Eighty one. Two camps have formed with regard to the guilt or innocence of Peter Suman. One camp subscribes to the position that he was indeed guilty of high treason; documents were discovered in the search of Loyalists that implicated Suman. The other camp suggests that Peter was innocent and that he was the victim of a combination of local politics and financial greed. Peter's farm in the Burkittsville District of Frederick County, Maryland, was reported to be both "beautiful" and "productive." It has been speculated that rumors were started that untruthfully tied Peter to the Loyalist plot. If found guilty of high treason, then Suman's land would be confiscated. His three Burkittsville farm properties were indeed confiscated by the state when he was convicted. It is also well documented that those of the Brethren faith were looked upon unfavorably by many citizens since they refused to take a position supporting the colonies during the Revolutionary War. Individuals fervent for the overthrow of English rule may have targeted Suman solely due to his faith; in other words, Suman should be punished for not aiding in the cause of the war. Remarkably, one of the most notable inconsistencies of this incident is that Peter's father-in-law was a strong supporter of the revolutionaries and that Peter's son (and Isaac C. B. Suman's father), Albert E. Suman, was a Revolutionary War soldier. An ACT for the benefit of Eleanor Shuman, widow of Peter Shuman, and her children. II. 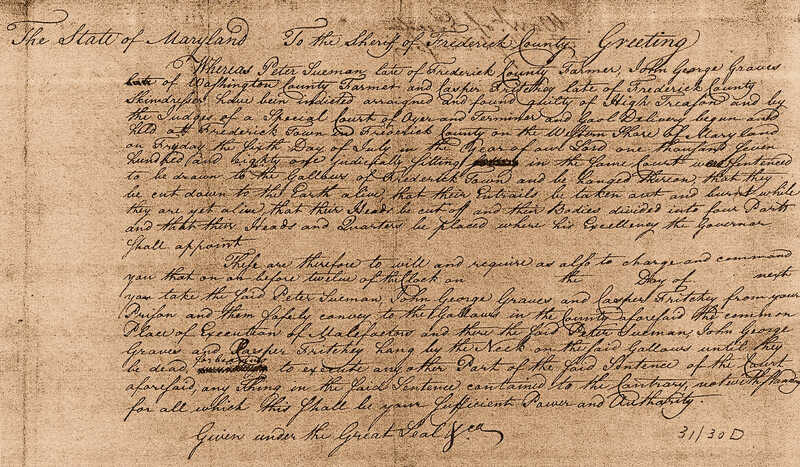 Be it enacted, by the General Assembly of Maryland, That all the right of the state of Maryland in the real and personal property be and is hereby granted unto, and vested in, the said Eleanor Shuman, widow, and the children of her and the said Peter Shuman, names Aaron Shuman, Catolina Shuman, Albert Shuman, Jacob Shuman, Peter Shuman, John Shuman, Eleanor Shuman, William Shuman, Isaac Shuman, Ganett Shuman and Anne Shuman, in manner following, to wit: One third part of the real estate aforesaid is hereby vested in the said Eleanor Shuman, widow, during her natural life, and after her death to her eleven children before named, their heirs and assigns, as tenants in common, and the remaining two third parts of said real estate is hereby vested in the eleven children aforesaid, named Aaron Shuman, Catolina Shuman, Albert Shuman, Jacob Shuman, Peter Shuman, John Shuman, Eleanor Shuman, William Shuman, Isaac Shuman, Ganett Shuman and Anne Shuman, and their heirs and assigns for ever, as tenants in common, in fee, and one third part of the clear personal estate is hereby vested in the said Eleanor Shuman, the widow, and the remaining two thirds is hereby vested in the eleven children aforesaid, to be equally divided between them. One final ironic twist to the treason story concerns Casper Fritchie, who was executed by hanging. Casper was the father-in-law of Barbara (Hauer) Fritchie. The poet John Greenleaf Whittier wrote an extremely popular poem in 1863 about Barbara titled Barbara Frietchie. Barbara is the ninety year old heroine of Whittier's patriotic poem, published at the height of the Civil War. In the poem, Barbara is exemplified as a strong Unionist residing in a state with an enormous number of confederate sympathizers (Maryland). She hangs an American flag atop her home's attic window. Confederate soldiers, led by General Thomas "Stonewall" Jackson, are marching through Frederick and spot Barbara's flag. General Jackson halts his troops and has them shoot at the flag. The flag falls from the its staff and Barbara snatches it and leans out the window shouting to "Shoot if you must this gray old head, but spare your country's flag." General Jackson, embarrassed, informs his troops to leave the woman and flag alone. Though the rebel troops remained in the town all day, the flag remained hanging and Barbara was not harmed. Barbara Fritchie is buried directly adjacent to Maryland's first governor, Thomas Johnson, at the Mount Olivet Cemetery in Frederick, Frederick County, Maryland. Recall that Thomas' brother Colonel James Johnson was one of the three judges that condemned Barbara's father-in-law to death. Mrs. MARY ELIZABETH BOWER, aged 96, one of the oldest residents of the county, was laid to rest in the family lot in Rose Hill Cemetery early this afternoon, following funeral services from her late home, 118 West Antietam Street. Mrs. Bower was the mother of seven children and incidentally was the seventh child herself. Only three children, Mrs. Blanche Bower Jackson, Annapolis; J. Scott Bower, this city; and A. Ellsworth Bower, Front Royal, Va, survive. She is also a grand and great-grandmother. Mrs. Bower remembered the Civil War in all details although Maryland was a neutral state. A brother, A. H. Suman served in the Confederate army while another brother, General Isaac C. B. Suman, led Northern troops. She was the last survivor of an old Southern family, being the daughter of Mary Elizabeth Neill Suman and Albert E. Suman. The death notice mentions that Isaac's brother Albert was a Confederate soldier. However, a book published in 1985 by Elmer Martin Jackson, Jr., titled Keeping the Lamp of Remembrance Lighted, suggests that Isaac's brother John was the Confederate soldier. Jackson writes that he had been corresponding with Suman family members in 1967 and was told that Mary had related stories to her descendants that Isaac and John had diverging political philosophies and were quarreling prior to the outbreak of the Civil War. 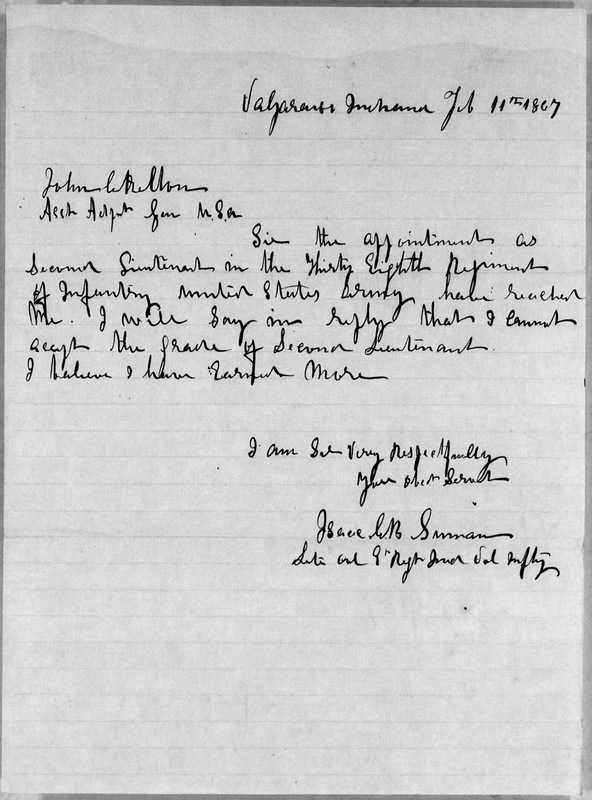 Note that Jackson, based on information he obtained from Suman descendants he was corresponding with, erroneously attributed Isaac as being a member of the Confederacy and John being commissioned a colonel in the Union Army. According to direct descendants of the Suman family, there was also considerable discord between Mary and her two brothers, Isaac and John. Given that Mary's death notice includes the statement that "She was the last survivor of an old Southern family," one has to wonder if Mary was the Suman sibling who was the Confederate sympathizer and that she projected her opposing political philosophy onto one of her brothers in disapproval of Isaac's exemplary service in the Union Army. The issue that arises with Mary's tale of North versus South within her Suman family is that no records appear to exist to support her story. 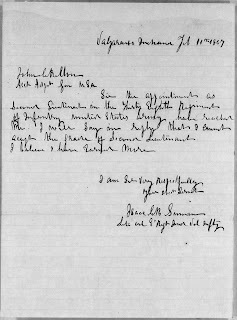 Extensive research examining both genealogical records, newspaper articles, and Civil War service records fails to disclose any Albert or John Suman serving among either Union or Confederate troops. This included searches using ten different spelling variations of the Suman surname. Though some Suman family genealogists mention Mary's story, none provide evidentiary support by citing extant records. I extend my appreciation to Ralph Bartles, who has researched the Suman family genealogy and provided information concerning Isaac C. B. Suman's siblings. Thank you! Cooper, H. Austin. 1998. A Pleasant View. Burkittsville, Maryland: Pleasant View Church of the Brethren. 505 p.
Jackson, Elmer Martin, Jr. 1985. Keeping the Lamp of Remembrance Lighted. Hagerstown, Maryland: Hagerstown Bookbinding and Printing Company. 236 p.
Kilty, William. 1800. The Laws of Maryland. Volume II. Annapolis, Maryland: Frederick Green. The Daily Mail, Hagerstown, Washington County, Maryland; May 24, 1927; Volume 99, Number 124. The Vidette-Messenger, Valparaiso, Porter County, Indiana; February 3, 1959; Volume 32, Number 178, Page 1, Column 4 and Page 6, Column 2. Column titled "Gen. Suman Among Most Noted People," by The Stroller (William O. Wallace).